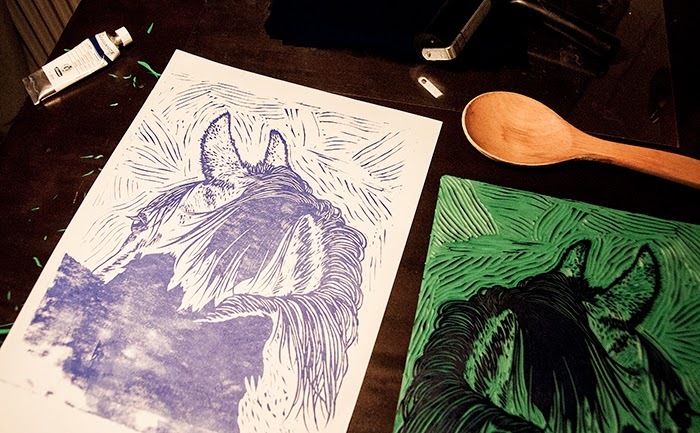 Here's what I'm working on - a print of a horse. Sweden is a country where you meet a couple of horse riders or mounted police whenever you spend more than 30 minutes walking anywhere in the city. I had in mind a pretty colorful print, but when I was sketching and carving I sort of swerved the other way. It's not a huge print (25 x 30 cm, just a bit bigger than A4) and I thought it was going to take no more than 3 days from start to finish. Now it's been almost two weeks - admittedly I got distracted by, well, life - and four working proofs, and I'm only beginning to like how it looks. The new green carving material is called Adigraf and it's quite interesting. 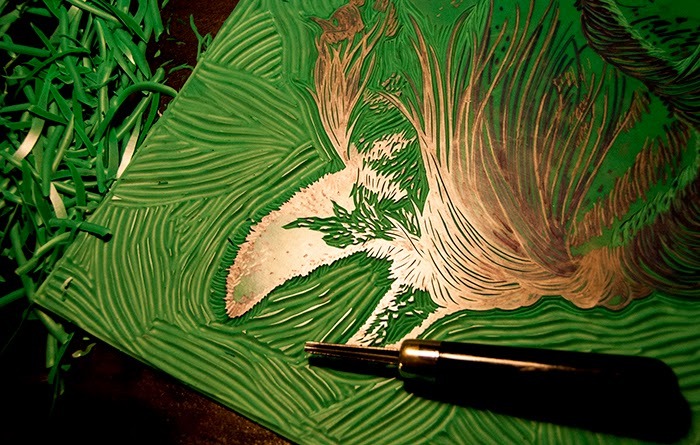 To be brief, it's way easier to carve than lino, but quite a pain to draw on and to carve in certain ways. I'll be writing a review on the material when I get around to it. 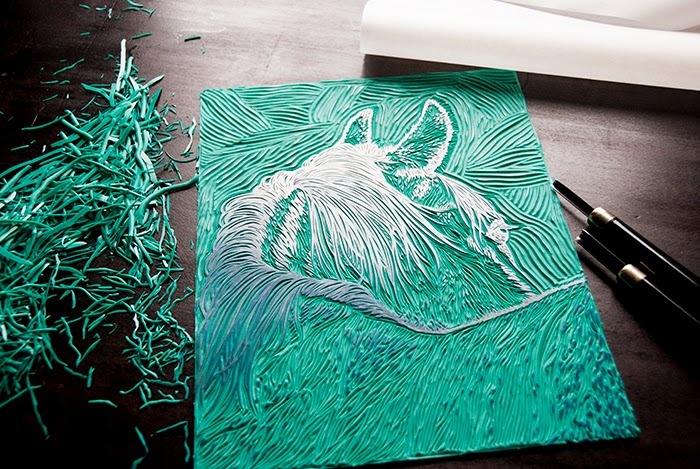 Now that I've almost finished carving and proofing, I'll be printing the horse tomorrow morning. I'm thinking about experimenting a bit with colors - I mixed red and blue when I was proofing and quite liked the way it looked. I've never made a print with so much open space before. The top part - the background, that is - is so big that it's quite hard to keep the area clean when inking the block. I've been toying with the idea to cut it all off with scissors (yeah, that's how soft Adigraf is) but am still feeling unsure. We'll see how tomorrow goes.